Crawley Borough Council plans to build up to 84 new homes in Bewbush. The homes will be built on the former Bewbush Leisure Centre site, which is earmarked for housing in the council’s Local Plan. Councillor Michael Jones, Cabinet member for Housing, said: “This is potentially a very exciting and positive development. 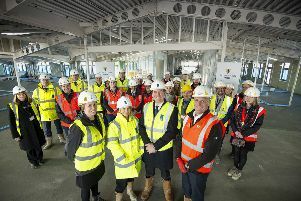 “It is intended that this will provide a significant number of new council rented and shared ownership homes, all 100 per cent Crawley Homes built and available to local people. Plans are still being developed and the final number of homes may change. Half of the homes will be affordable rent and the other half shared ownership. All will be built by Crawley Homes – the council’s housing service. A planning application for his development is expected in the autumn.